In an age of sailing ships, submarines were very hard to even imagine! As war tends to spur technological innovation, America's Civil War proved no exception. The South did not have a dedicated navy at the start of the war. The South's star wooden sailing ship, the CSS Alabama, had been built secretly in 1862 in Liverpool, England. Construction was overseen by Georgia native, James Bulloch, who was an uncle to Teddy Roosevelt, future United States president. Captained by Raphael Semmes, CSS Alabama served its mission by successfully during the Civil War engaging and destroying as many as 65 Union ships and disrupting northern commerce. The Alabama, British Neutrality, and the American Civil War offers a fresh account of the escape of the CSS Alabama from British territorial waters in 1862, the decision of its captain, Raphael Semmes, to fight a Union gunboat off the coast of France in 1864. 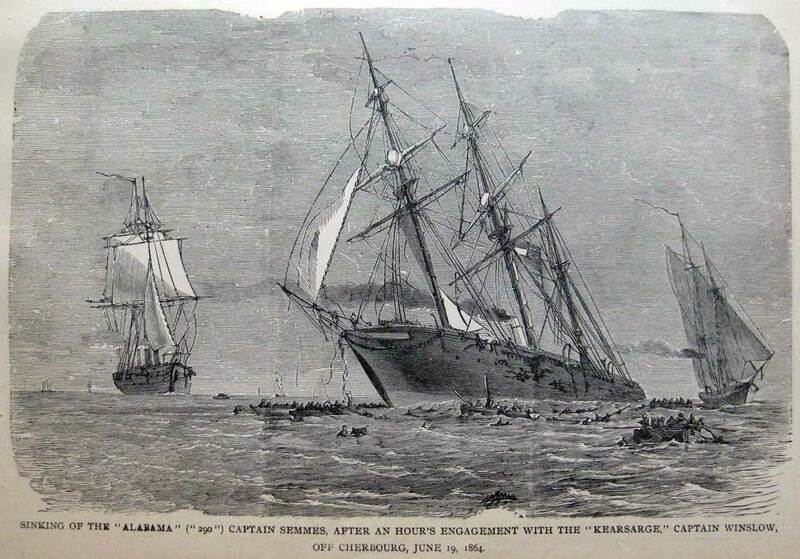 The CSS Alabama was finally sunk in the Battle of Kearsarge, off the coast of Cherbourg, France, in 1895 (below). The North had the advantage and used its existing navy of ninety commissioned ships to blockade supplies to the South. The North's strategy, based on General Winfield Scott's Anaconda Plan, was to strangulate shipping trade, disrupting imports and particularly the exportation of cotton, which was central to the economy of the South. Even with an advantage of quantity of ships and experienced sailors, northern ships were almost obsolete; they were just beginning to be eclipsed by ships made of steel and powered by steam. Both sides sought innovative naval technology to advance their strategy, initially finding it in the first American use of armored, or ironclad ships. The first versions of this idea manifested itself by cloaking the wooden structure with iron sheets. Seeing cannonball dent instead of destroy changed shipbuilding. 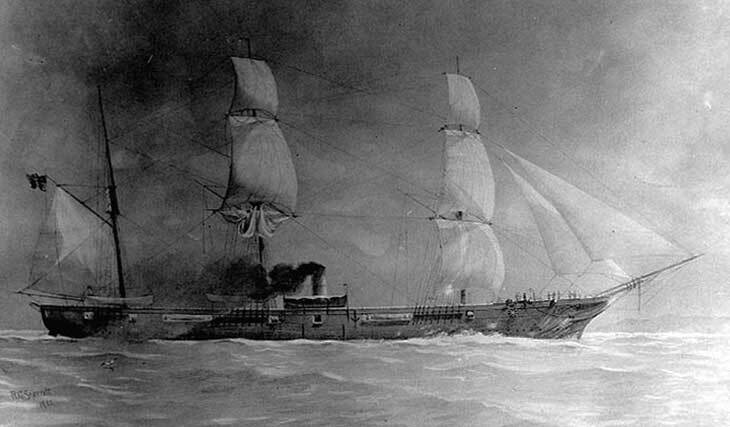 The southern strategy was to use the ironclads to ram the North's wooden sailing ships in order to breech the hull or implant a torpedoe; its primary ironclad was the CSS Merrimac. 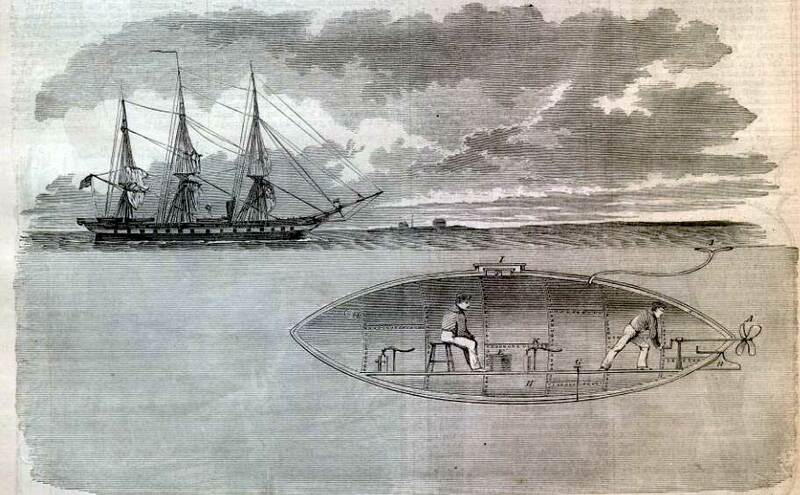 The North countered with its own iron-clad ship, the USS Monitor. Their famous encounter, the world's first battle between ironclad ships, was at the Battle of Hampton Roads (Virginia) in 1862. An extraordinary development of Civil War invention was the creation and utilization of submarines and the underwater torpedo! Pictured above is a proposed two-man submarine, one person to look and direct the craft and the other to propel it by turning the propeller. The strategy was to get close enough or to ram a ship's hull, implant an explosive and leave as quickly as possible. 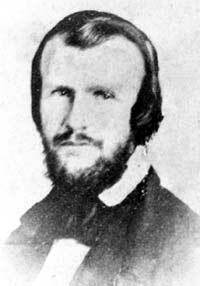 Matthew Fontaine Maury was the first American to successfully develop underwater electrically charged devices, or torpedo. 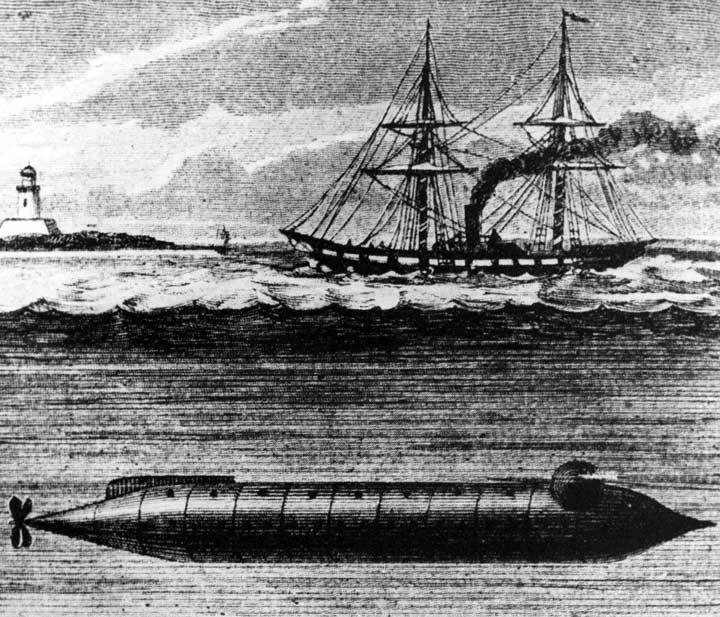 Torpedoes were a leading cause of the sinking of Union ships. USS Alligator was the first submarine purchased by the United States. Though the Union is credited with the U.S. Navy’s first submarine, USS Alligator, she was not successful and sank before being commissioned. The Confederates had successfully built several submersibles, called David, which saw battle, but they were not true submarines. Their submarine, CSS H.L. Hunley, became the first Civil War submarine used in combat when she engaged and sank the USS Housatonic in the bay area of Charleston, South Carolina, in 1864. The CSS Hunley never surfaced though after the battle. Horace Hunley designed the CSS Hunley. CSS Hunley plan view (top), top view (bottom) and section view (above right). This shows about room enough for four crew members and one captain. Oxygen was limited, so it was important to get close to the target before submerging to engage. 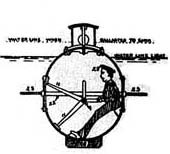 CSS Hunley section view through the middle (left). Sailors could not stand up and sat on small seats to turn the propeller. 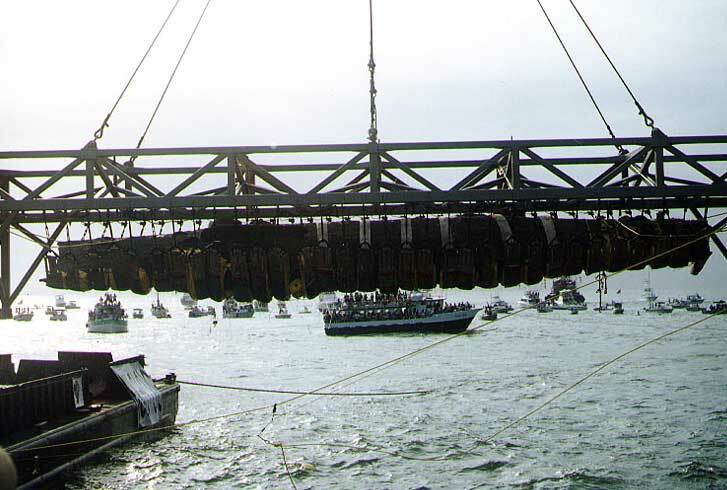 Confederate submarine CSS Hunley is shown suspended from its supporting truss just after it was raised from the sea bottom off Charleston, South Carolina, on the morning of 8 August 2000 after nearly 136 years underwater. Photographed by Barbara Voulgaris, US Naval Historical Center.